January 19, 2009, Geneva, Salon International de la Haute Horlogerie (SIHH): Montblanc is presenting the installation ‘Montblanc -Writing Time’ by Robert Wilson, at its exhibition booth at SIHH 2009. The installation has been especially created for the exhibition booth and is based on the multimedia performance event “Writing Time” by Robert Wilson for Montblanc shown in 2008, at a glamorous gala evening in honour of the launch of the Montblanc Star Nicolas Rieussec Monopusher Chronograph, Montblanc’s Chronograph with its first own in-house movement. Robert Wilson is the fifth artist in a row, whose artwork is presented by Montblanc at SIHH. After the British artist Philippe Bradshaw created a special artwork as a tribute to the launch of Montblanc’s female collection in 2005, German Stefan Huber focused on Montblanc’s 100th anniversary and the icon of the Montblanc emblem, in 2006. In 2007 Swiss artist Lori Hersberger artistically visualized Montblanc’s new Diamond Collection and in 2008 Swiss artist John Armleder’s lightning wall reflected on the aspect of movement and acceleration and the philosophy of the brand. Now Robert Wilson -together with Serge von Arx, who co-designed the artwork -opens new dimensions with this unique installation ‘Montblanc -Writing Time’ and pays again tribute to a very special watch, the Montblanc Star Nicolas Rieussec Monopusher Chronograph. Asking Robert Wilson, one of the world’s greatest cultural genius, to create a unique and memorable spectacle for the launch of the Montblanc Star Nicolas Rieussec Monopusher Chronograph with its first own in-house movement, was a must. Not only because of the long lasting friendship between Montblanc and the artist, but mainly because of Wilson’s outstanding artistic work about ‘time’ and ‘movement’. So who else, if not Robert Wilson, could celebrate the birth of an historical moment in the history of Montblanc’s watchmaking? In his works, no matter if it is drawing, sculpture, furniture design, opera or theatre, the artist exposes what time means in all its dimensions. Seeing the world through his eyes is a privilege and makes us sensible for the things which are of importance and part of Montblanc’s philosophy: taking time to reflect, time to care about friends, time for a personal note and recognising our lifetime as a precious and irretrievable journey. In his installation ‘Montblanc -Writing Time’, the artist lets us hear, feel and see ‘time’ in a three dimensional perception. He invites us to experience the inner life of a watch, its mechanical movement, its ticking sound, its colours, which are a mix of light and shadow. We feel like being part of Wilson’s magical installation and seeing the world from another point of view. Rooted in the culture of writing, Montblanc sees its responsibility in supporting the arts in numerous international cultural activities as part of the brand’s philosophy since many years. This also applies to the SIHH where Montblanc presents every year an outstanding artwork of one of the artists who are long-time friends of the brand. The artworks are always placed in the centre of the booth entrance area; each artwork is an artistic interpretation of the principal theme of Montblanc’s annual product presentation. 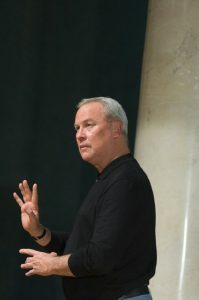 Robert Wilson, born in Waco, Texas, October 4, 1941 served several times as a jury member of the Montblanc de la Culture Arts Patronage Award since the 90ies and celebrated with Montblanc his 65 birthday in Hamburg, together with the premiere of the documentary ‘Absolute Wilson’.